"There are two ways of life open to a person here on earth," says Joel Goldsmith in Living the Illumined Life. "There is the human way, the way of the unillumined, and there is the spiritual way, the way of the illumined." What is the difference? The unillumined individual is living by and through his own powers, wisdom, and strength, Goldsmith explains. It is a life of toil, effort, and worry, often limited in education, limited in experience, limited in background, or limited in finances. The illumined individual is living in conscious awareness of an indwelling Presence, Being, Power. He has realized that he is not living his life alone: "I live, yet not I; this spirit of the Lord God which is upon me is living my life." This is a life of infinite capacity and complete freedom. Goldsmith boldly asks the reader: "Do you believe that the spirit of God dwells in you? Do you believe there is an indwelling Christ in you? Do you believe that you are the temple of God? Do you believe that you can do all things through Christ that dwells in you?" If you cannot answer in the affirmative, he says, you are still the unillumined. But, he encourages, you are the one who can change that. 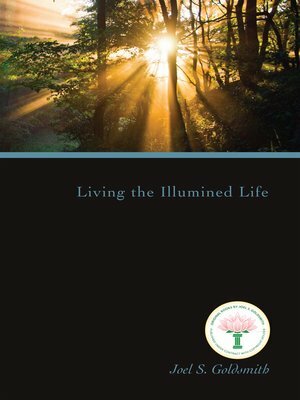 For those who are inspired to make the transition and live life as one of the illumined, Living the Illumined Life clearly lays out the principles and practices that can purify consciousness and lift the sincere seeker to the awareness of the Presence and Power within. Then as illumination comes, he can walk free and unfettered, without fear, by Grace.